Created using the latest developments in nano technology, DieselFusion is an all-inclusive, patented diesel fuel catalyst in a concentrated formula to increase engine performance and efficiency and protect your diesel engine year-round WITHOUT the damaging effects of alcohol. 1. DieselFusion’s hydro filtration process creates specific carboxylate nanoparticles, which average 0.002 microns in width, which are the key component to our product. When introduced into diesel fuel, the particular nanoparticles cause a complex reaction that transfers an electron to the reacting molecules causing a delocalization of the electron cloud creating a chemical and molecular process of reverse catenatation. This process causes the polar bonds of the inefficient long chain hydrocarbons to weaken resulting in shorter hydrocarbons that burn more efficiently which significantly increasing fuel economy and horse power. As a result of a cleaner burning fuel, emissions such as Lead (Pb), Carbon Monoxide (CO), Nitrogen Oxide (N0x), Sulfur Oxide (S0x), Sulfur Dioxide (S02), Sulfur Trioxide (S03), Unburned Hydrocarbons (HC), Sulfur (S), and particulate matter or soot (PM) are dramatically reduced. DieselFusion’s molecular charged nanocatalyst also bonds with less negatively charged Sulfuric Acid (H2SO4) compounds, the leading cause of Acid Rain, and chemically alters it into Magnesium Sulfate (MgSO4), which is a neutral compound (Mg0 + H2S04 → MgS04 +H20). 2. DieselFusion’s charged nanoparticle micro lubricant blends with diesel fuel increasing lubricity in EPA mandated ultra low sulfur fuel. The micro lubricant also creates a reactive polar bond that attaches to the surface of the internal components of the engine providing a protective layer for the fuel system, engine seals and gaskets. This layer reduces friction between moving parts, cushions moving parts against shock, and helps with compression by sealing micro gaps between piston rings and cylinder walls. Our micro lubricant also protects vital engine components from rust, corrosion, and deterioration caused by water and alcohol in the fuel. The lubricated internal engine components stay cleaner, smoother and protected extending the life of your engine. 3. DieselFusion’s nanoparticles molecularly attach to carbon built-up that collects and hardens on the cylinder heads, cylinder walls, pistons and valves and slowly softens the deposits allowing them to re-burn more easily increasing engine efficiency and performance. DieselFusion’s molecular softening action also gently cleans the entire fuel system of gum and varnish. Tests have also shown a significant reduction in algae growth from bacteria, fungus and yeast biomass in diesel and bunker fuels. 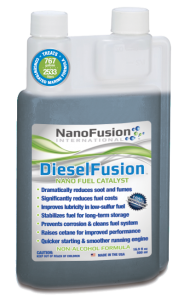 DieselFusion’s innovative nano technology based fuel catalyst offers proven benefits that are unlike anything currently available in fuel treatments today. *DieselFusion meets ASTM Standard D975 and will not change vital fuel specifications or void engine warranties. DieselFusion has been extensively tested to be non-corrosive to all rubber, metal, plastic and fiberglass components in your engine and fuel system when dosed properly and can be safely stored with no worries of dangerous or corrosive reactions. Diesel-Fusion has also been extensively tested to be safe with turbo and non-turbo charged diesel engines. The active ingredients in DieselFusion have been certified by Southwest Research Institute (SWRI) to not change vital fuel specifications or critical properties to gasoline/petrol fuels as defined in ASTM D975, D2880 and Def Stan 90-91 when used as directed and will not void engine manufacturer warranties. DieselFusion is considered non-hazardous and non-pollutant to marine life by the International Maritime Organization standards. As an eco-friendly organization, it is our priority to protect our fragile ecosystems and to create a cleaner and safer planet for our children. The shipping and transportation information listed with the Department of Transportation (D.O.T.) classify DieselFusion as a non-regulated product when shipped in containers of less than 110 US gallons. To obtain best results, use ½ oz /15 ml of DieselFusion for every 20 gal / 76 L of diesel fuel. In order to mix properly, DieselFusion should be added to the tank prior to dispensing fuel. Over treating will not increase results. *For Bio-blended fuels, an initial double dosage of 1 oz / 30 ml of DieselFusion per 20 gal / 76 L of fuel is recommended. The standard ½ oz / 15 ml to every 20 gal / 76 L of fuel ratio should then be used for subsequent refueling. 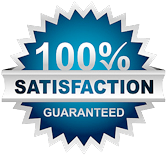 If you do not save more by using DieselFusion than it cost you to purchase the product, we will refund to you the purchase price of the product. * Results can vary depending on total engine and age, temperature conditions, barometric variations, proper maintenance and other factors. Some engines will take longer to show positive results than others because of pre-existing deposit build-up.